1998 OR2 at closest approach to the Earth later today. Spaceweather.com has a nice list of asteroids passing by the Earth this month, and a lot of people probably remember asteroid 2009 DD45, which passed by the Earth at a distance only one fifth that between us and the Moon. There was a fair bit of news on that because that distance is extremely close in cosmic terms, and because the asteroid wasn't discovered until a few days before it passed by. Still, the asteroid was only 27 m or so in diameter so it wouldn't have inflicted all that much damage anyway. 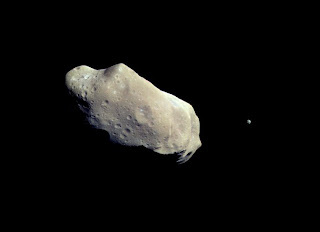 This asteroid flying by today is pretty much the opposite: much farther away, but also much, much larger. It's called 1998 OR2 so we've known about it for quite some time, and it has a diameter of 3.3 km. That's huge for an object flying fairly close to the Earth. Mars' second moon Deimos for example has a diameter of 15 × 12.2 × 10.4 km, so though it's still not comparable it's only about one class below Deimos. 243 Ida is the larger one, and it has a diameter of 53.6 × 24.0 × 15.2 km. Its moon Dactyl, however, is smaller than 1998 OR2 at 1.6 × 1.4 × 1.2 km, so this asteroid is quite a bit larger than Dactyl. One other comparison you could make would be between 1998 OR2 and Central Park in New York. Central Park has an area of: 3.4 km². 1998 OR2 has a radius of 1.65 km, so that gives a surface area of about 34 km², so Central Park times ten if you were standing on its surface and wanted to walk about. LD = Lunar Distance, or the distance from the Earth to the Moon (384,400 km). This is just about the only time that this unit comes in handy for visualizing distances. You can see that 1998 OR2 is a nice comfortable distance away so there's nothing to worry about, but its size gives it a magnitude larger than the last interesting asteroid to fly by (2009 EW) even though 2009 EW was 70 times closer. A sky-survey telescope based on in Hawaii has discovered two new, mile-wide asteroids heading toward Earth's orbit. But unlike the movies, neither is expected to come anywhere near our planet for decades at least. The newly discovered asteroids 1998 OH and 1998 OR2 are both large enough to cause global effects if one impacted Earth, and both are classified as "potentially hazardous objects" because they pass periodically near Earth's orbit. Target Type: Liquid Water of depth 4500.00 meters, over typical rock. The major seismic shaking will arrive at approximately 400 seconds. Nothing would be felt. However, seismic equipment may still detect the shaking. The ejecta will arrive approximately 764 seconds after the impact. The air blast will arrive at approximately 6060 seconds. So if you were far enough away (and chances are most asteroids would land either in the ocean or in an uninhabited part of Russia or Canada) you would hear a blast and probably see some fine fallout, which is pretty scary but it wouldn't be life-threatening. Now I'm going to see what I can find on this asteroid and I'll continue to update the post as I find more. I assume at least a few observatories are training their gaze on this asteroid considering its size.